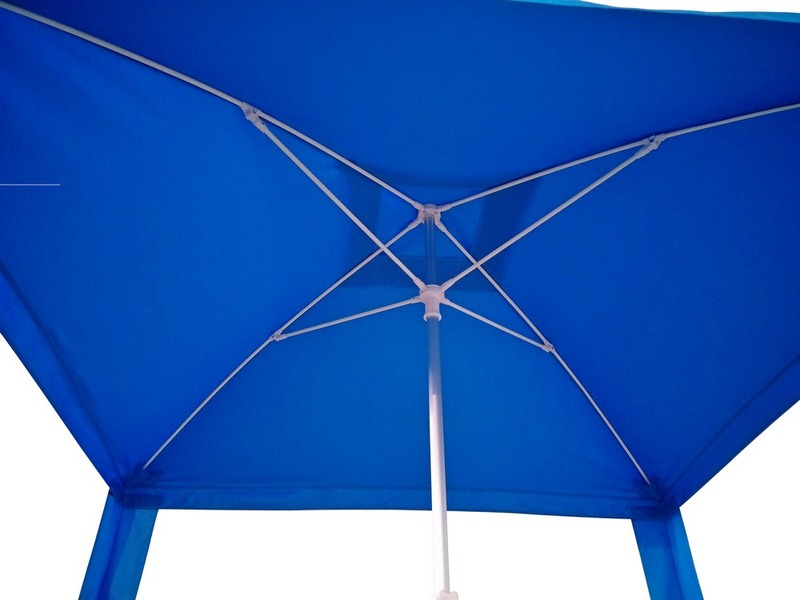 3-in-1: Portable, Folding Sun Shade Umbrella / Cabana Tent / Boat Shade. 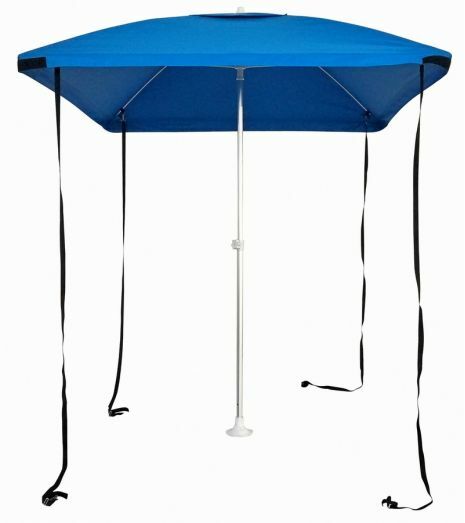 Protect yourself and family from sun or rain with deluxe cabana umbrella. Also can be used as a boat shade! Unique design, commercial-grade, square shaped beach umbrella with multitude of uses. 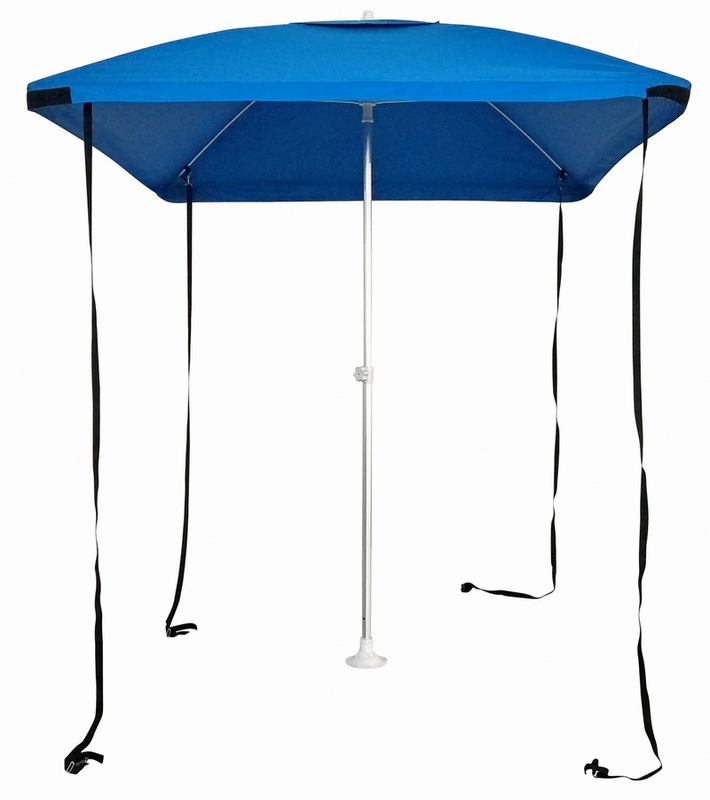 Can be used as a beach umbrella, beach cabana, picnic or vendor tent, or as a boat sun shade. 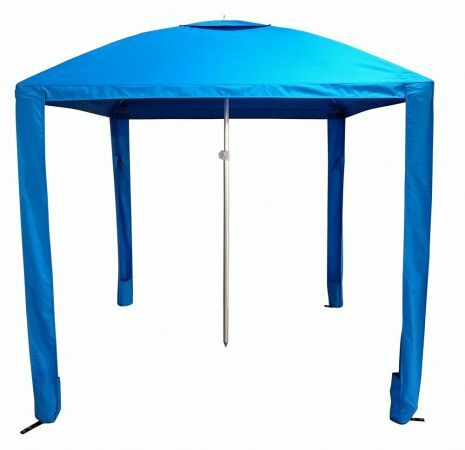 Heavy-duty fiberglass rods, adjustable length aluminum post, and adjustable length removable straps, allows installation of this umbrella on a hard surface, such as boat deck, or into soft surface, such as sand, grass, gravel, etc. Comes with oversized plastic suction cap flange, for installation on a hard surfaces, and sharp pointed rod for installation into soft surfaces. Both included! 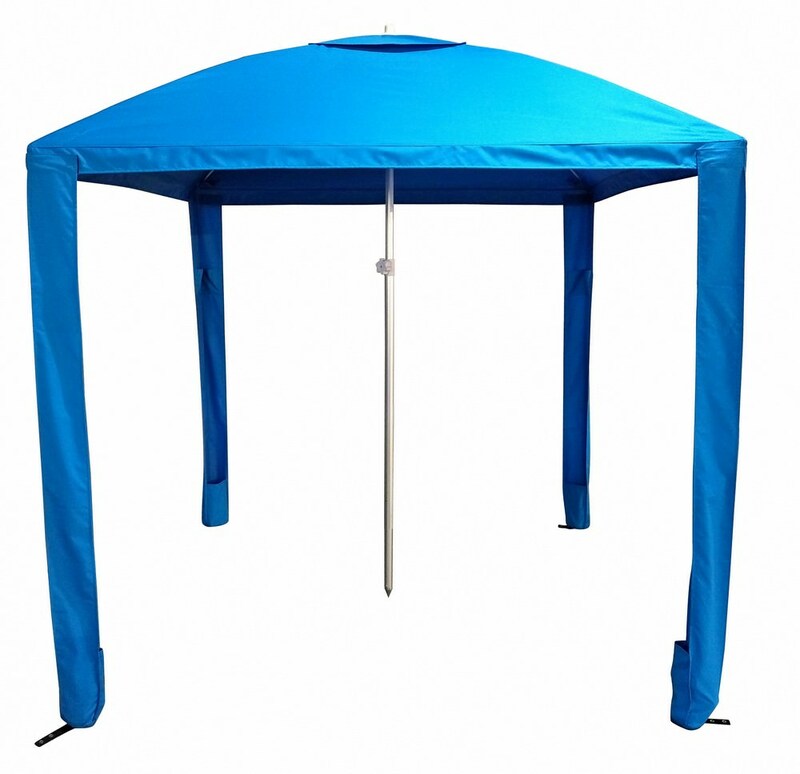 Detachable cabana sides can be attached to umbrella top with a Velcro. 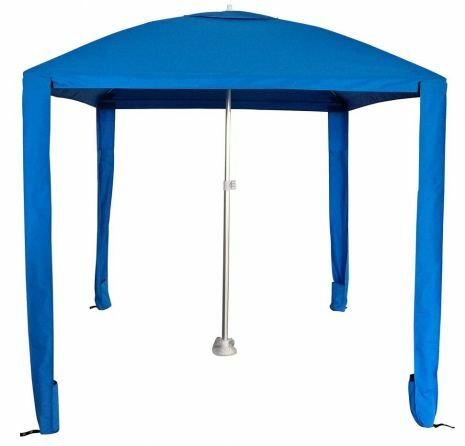 Cabana sides have special pouches that can be filled with a sand, or any other heavy objects, to keep umbrella vertical in a wind, and provide attractive appearance of beach cabana. Cabana sides also comes with convenient pouches for storage of bottles, cell phones, MP3 speakers, and other various gear. In addition, cabana sides bottoms have short nylon straps with grommets for optional pegs insertion. Assembly is easy. Just slide pointed rod at the bottom of main pole, until pushpin will click locked into the position. Then push assembled pole into the sand, and vigorously move from side to side, while pushing down on a pole, until pointed rod inserted all way into the sand. Or, you can insert short piece first, and then snap main pole over short piece once it is inserted into ground. You can also use rubber mallet to run pointed rod into the ground, and then snap main pole over it. 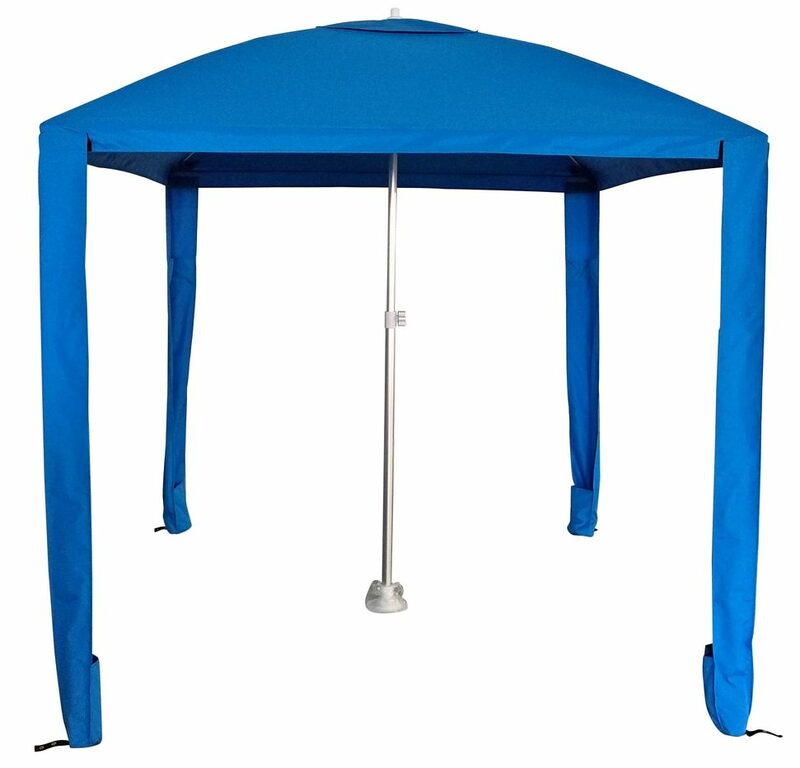 Once main pole is firmly in, slide umbrella pole into the main pole, and secure with a plastic knob. Depending on application, cabana sides can be attached with a Velcro. 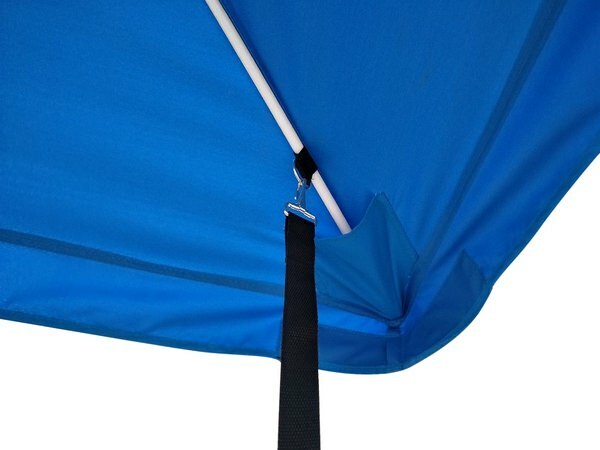 Or adjustable nylon straps can be secured with snaps to D-rings at ends of umbrella ribs. To use cabana sides, fill pouches at end of sides with sand, gravel or any other type of heavy objects, such as rocks or gear for example. This umbrella is not a toy. It is extra heavy-duty, commercial grade product. Length of bag with folded down umbrella is 65". Weight of carry bag with umbrella is 11 lbs. Complimentary storage bag is included. 4 detachable cabana sides included. Only 2 cabana sides can be used facing windy side, if extra space is required. Please click on Pictures tab for installation steps.